Chi Of Life > Why Choose Us? Our guaranteed 100% successful and proven weight loss program, for over 20 years Gwen has helped thousands of people just like you. Quality of program providers, all our team members are listed on our web page with their qualifictions. We restrict the number of participants attending to 1 – 9 people, so we can deliver a personalised program to focus just on you. Small groups means “it’s all about you” and we can provide a highly professional program thats just right for your medical condition or if you have injury. We specialise in programs for people who fall into the obese catergory. I have hand picked my team and they are the best of the best, why settle for less? Dont take our word for it check out their credentials on our website and wat our past guests say. We are the only retreat that offers a complete holistic wellness program combined with a variety fun fitness adventures. We offer a 100% money back guarantee you will lose weight and centimeters. We are the only retreat that provides meals for your personal metabolic nutritional type. We do not offer a one size fits all program like other health retreats in QLD, as this only produces inconsistent results between participants. Do you want to gamble with your time and investment that you fall into the lucky ones who achieves results? Long term successful weight loss results needs to start on your foundation inside out you need to know if you have digestive issues, adrenal fatigue, thyroid issues, lymphatic congestion, colon toxicity. When you improve your foundation your ideal weight and energy is restored. You will get answers to why you are unable to achieve weight loss or why your metabolism is slow. You will receive a live and dry blood analysis and this provides vital information about your current health and what type of program is best for you ranging from detox, restorative, rebalance, kick start and what level of fitness program is best for you. Our 20 day program tackles the underlying issues around weight loss and emotional or over eating with a master NLP therapist. We provide delicious organic meals prepared by our chef that are restaurant quality, only the best local ingredients are used. Hands on cooking workshops, you will assist and prepare meals in our kitchen so you will be able to go home and know how to prepare the meals. Eating in a restaurant does not teach you or prepare you for making changes at home. Quality of food, we do not skimp on your meals and include superfoods, fresh fish and seafood from Mooloolaba wharf,produce from the local farmer growers. Our guests consistently rav about the quality and how satisfying the meals are. You are never hungry and will feel satisfied. We can cater for vegetarians and vegans, please advise your requirements. No mater what weight or size or fitness level you our specialist trainers are the best of the best and we can provide a effective and safe program for you. This is not a one dimensional solution and program that the weight loss and fitness industry offers. Our program provides you with cutting edge information that will transform your life to live in complete wellness. You will have more energy and reduce or even may not need medical drugs as you restore your foundation diets will be a thing of the past. Without your health what do you have? Variety of exercise options for you to choose from no matter if you are unfit or a gym junkie you will feel comfortable to exercise at your level. Gwen and her team will care and nuture you in a safe enviroment. Best location, we are close to the beach in Mount Coolum with private access by beach buggy or bike. Educational program, you will learn about food, your body, your wellness, receive handouts, recipes and fitness tips. You will receive a personal eating plan including stratergies to improve your wellness and you will experience a true transformation. Dont take our word for it our success stories are from real people who have attended the retreat. We welcome reviews from our guests on facebook where it is open to everyone to write about their experiences at the retreat and we consistently receive 5 stars from all guests who have attended. On-going at home support for you, we are there for you whenever you need us. We dont just focus on weight loss, we want you to leave as “Chi wellness warriors”! The Chi of Life weight loss retreat is proud to have transformed hundreds of lives. Take 54-year-old Terri for example. Terri was 120kg and admitted she never liked herself, even stating that she was “disgusted” and “hated” herself before attending Chi of Life in February 2014. 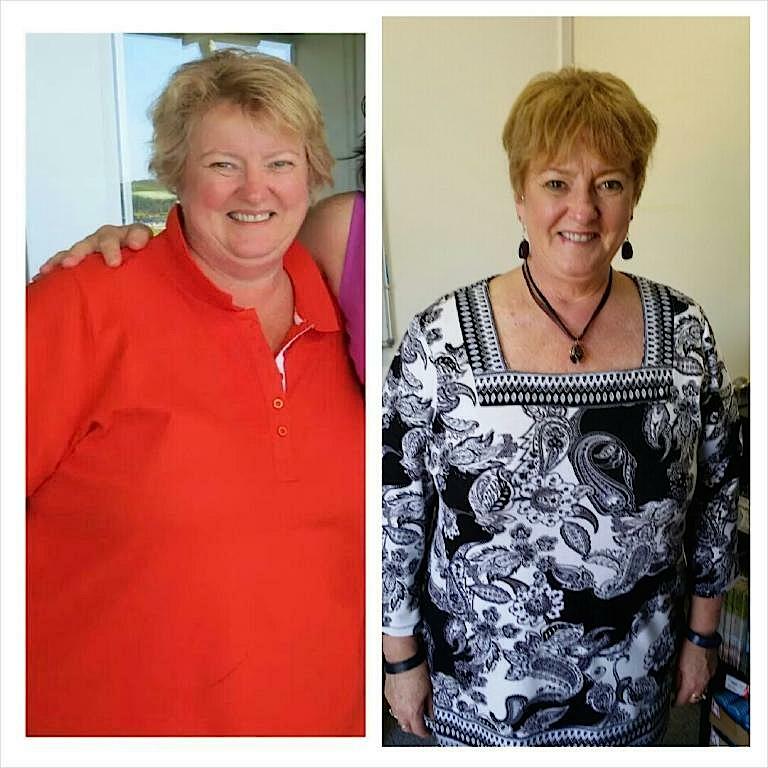 Terri is now down to 86kg and is a self-professed exercise junkie. Chi of Life Weight Loss and Wellness retreat offers specialist fat camp and weight loss programs suitable for men and women of any age, weight, size, and fitness level. We specialise in obesity programs for people over 100kg, and Gwen encourages anyone suffering lethargy and weight gain to look into Chi of Life weight loss retreat for long-term, sustainable weight loss, improved energy and vitality. Call us on 0435 125 422 to have a chat about how we can help you get started.